Brazil are South American sevens champions – again. It appears there are now three certainties in life – death, taxes, and Brazil winning the South American Sevens. Since 2004 Brazil have taken part in 13 out of 14 South American Championship (or South American Games, which has occasionally taken its place) and have won all 13 (they did not take part in 2015 as the tournament was an Olympic qualifier, and they had already qualified as hosts). Which made this year’s final a standout as the “Yaras” only won by 17-10 – the best result by any South American team against Brazil since 2012, and the closest final since 2004 (when Brazil only won 15-12 against Venezuela, who were not in Montevideo this weekend due to domestic problems in that country). The championship was played as part of the traditional Valentín Martinez Tournament, played annually in Montevideo, Uruguay, and means Brazil have won a place in the Langford round of the World Series, and the World Series qualifier at Hong Kong. 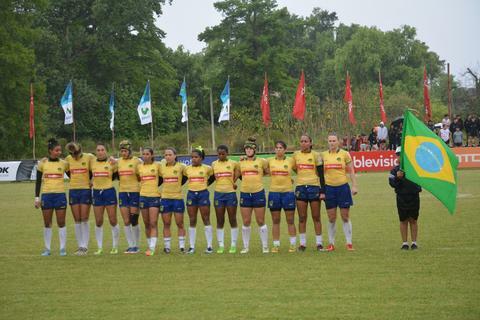 In the quarterfinals on day two, Brazil beat hosts Uruguay 31-0, the Peru 31-5 in the semis on their way to the final. Elsewhere there were signs of change. Peru – who used to firmly at the bottom of the rankings – reached the semi-finals, and Argentina still just hold a advantage over Colombia, but needed extra time to win their semi-final.